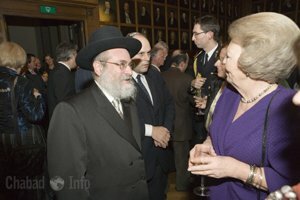 Shliach Receives Dutch Honour From Queen This morning, Rabbi Binyomin Jacobs, Chief Rabbi of the Inter-Provincial Cheif Rabbinate in Holland and member of the Rabbinical Centre of Europe, was made an Officer of the Order of Orange-Nassau, one of the highest civilian awards given by the Queen of Holland. The honour is usually given to princes of other royal families in Europe, diplomats, artists, and social activists. It is the first time in the history of the Dutch Jewish community where a rabbi has received this honour. Rabbi Binyomin Jacobs, who is 62 years of age, was born in Holland and has served there as a rabbi for over 30 years. The award was given to him for his activities building bridges in Dutch society, especially for his interfaith and inter-communal work, for his position as rabbi of the Sinai Medical Centre in Amtelveen, for his activities on behalf of the Jewish community as the Chief Rabbi of the Inter-Provincial Cheif Rabbinate and for his activities on behalf of European Jewry as a prominent member of the Rabbinical Centre of Europe (RCE), Brussels-based organization representing over 700 European religious leaders and dedicated to meeting the needs of Jewish communities in Europe. Thanks to these and many other activities, Rabbi Jacobs is a well known personality in Holland and is a highly sought after lecturer and interviewee in the Dutch media. Rabbi Jacobs was at the forefront of the battle which successfully cancelled a proposed law that would have banned shechitah, Jewish religious slaughter. “This is an important day for Jews in this part of the world,” Dr. Wesly said. “The award given to Rabbi Jacbos is an honour for all the Jews in Holland. It gives our community great pride and we thank God and congratulate Rabbi Jacobs and his wife on this great honour." The Order of Orange Nassau was established 120 years ago and given by the Queen of the Netherlands. The award is given every year on birthday of Queen Beatrix. It is given by her representatives to people all over Holland. The Order of Orange-Nassau is a chivalry order open to "everyone who has earned special merits in society". These are people who deserve appreciation and recognition from society for the special way in which they have carried out their activities. The order is comparable with the Order of the British Empire in the UK.